1. These are fully automated Patched cracked Pass4sure installer setup. You don’t need to do anything. There is no need for any serial number or registration code. 3. I recommend that don’t install it on your main system partition. You should use virtual PC machine or VMware. However if you don’t have any important app, you can install this without worry !! 4. Please note that this P4S setup will not work on windows VISTA OS. You can use virtual PC in vista. 5. You must install this setup from C drive. That means your windows XP must be installed on C drive. 6. If you are installing the setup for the first time, select both of the options. Q1. It is asking for serial number after installation! What should i do? Sol: 1. Did you restart the computer after installation? If not, then restart it. 2. Check your DCOM Server Process. If it is running, DISABLE it manually. 3. Choose “Disabled” from the “Startup type” drop menu. 4. Click on Apply > O.K. 5. Restart your PC. After restart the “Service Status will turn to ‘Stopped’. Q3. It is still asking for serial number ! Sol: Check the volume ID. 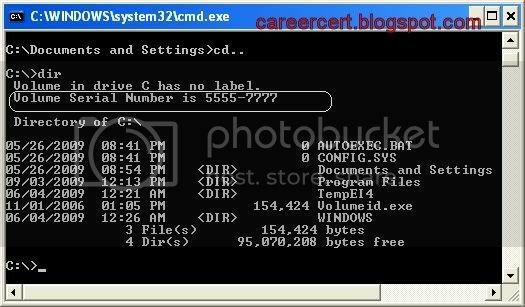 If it is not set to 5555-7777, then change it manually. 1. Open a cmd window. Q4. How should i change the volume ID manually? Sol: 1. Download “CareerCert’s volume ID changer” and run it. Q5- My CPU usage goes above 50% after running Pass4sure engine !! Sol:- Use BES software to limit the CPU usage for p4s. If you are still facing problems, please post your feedback here. i have windows 7 i can not install P4S 640-802. SO any help pls. @above, These instructions are appropriate for the old versions of p4s. This method does not work anymore. maybe i am just blind – but HOW or WHERE can i DL this crack? I thought there is no Crack available for p4s. This is why there is a pdf-group-buy. I want to know where the questions are stored for pass4sure. I have tried installing the Network+ installation from pass4sure.tk and it installed correctly but is version 10.0. The new version is 3.10 and around 900+ questions, the one I got from pass4sure.tk is about 700 questions. I have swapped the exe from one of my other workstations that have the new version but it still pulls the old questions. I suppose the license file has something to do with how it knows which questions to pull or maybe I am missing something.